Centerpoint Manufacturing, Inc. began in 2002 just after 911 to serve the needs for real security from terrorism and other acts of vandalism or violence. Other companies had sold inferior and misleading receptacles. The Naval Ordnance of Indian Head, MD tested ours along side others and found that Centerpoint was the only products that would meet the future ASTM Standards. We provide security solutions for the military, government, public, corporate venues and events to safeguard employees, patrons and customers. We will create an attractive, cleaner and safer pedestrian environment by providing products that reduce damage and save lives while protecting the reputation and livelihoods of stakeholders. Has your firm ever produced a wonderful visual space only to arrive at the opening ceremonies to find unsightly trash receptacles clashing and cluttering up the landscape? Every architect and interior designer we know has had this experience and was not consulted when those choices were made. Maybe the administrator, facility manager or a custodial employee made the decision. No one considered the security aspect of this decision. Trash receptacles become deadly shrapnel when someone with malicious intent places an Improvised Explosive Device (IED) in them. There are over 4,000, and many years over 5,000, explosive incidents per year in the U.S. according to the Alcohol, Tobacco, Firearms and Explosives Bureau that is charged with keeping these records. Most are small IEDs. Many involve trash cans. Those statistics were constant before 9/11. The potential now for an explosive incident is much greater and will be much deadlier. The use of trash bins as bomb containers in shopping malls, transit stations, events, and schools is the easiest place to hide terror. The nature of explosives, with velocities over 25,000 feet per second and thousands of tons of pressure from IEDs can create tremendous carnage and destruction if not mitigated. The shrapnel alone can travel several hundred feet and cause a fatal injury to anybody in their path. The building design team should select and locate the trash receptacles that will enhance and blend into the exterior and interior spaces and in the process perhaps provide security. 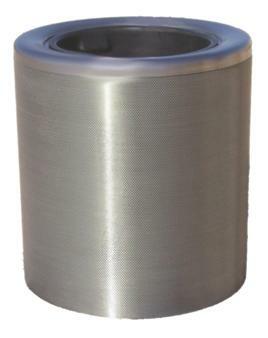 The Centerpoint Security Trash Receptacles, built with heavy U.S. steel that will last as long as most buildings, are available in brushed coated finish stainless steel, which is recommended for exterior coastal applications and an anti-graffiti three coat urethane paint finish in any color desired that can be wiped clean with provided special cleaners. A snug fitting, frangible polyethylene cover is an attractive accessory to keep outdoor contents dry or hide interior trash. You can be assured that the product you specify is the one that Centerpoint delivers. The company is a U.S. owned and based manufacturer that has been building explosive resistant products over 5 years. The owner is a Professional Engineer that worked in the construction industry before starting Centerpoint Manufacturing, Inc. Our slogan, “Protecting Lives and Livelihoods”, is not taken lightly. Our products have a safety factor built into them and they pass all test criteria every time. Give your firm and your client an opportunity to experience the security and longevity of the Centerpoint Security Trash Receptacles on your next project. Fabricated with galvanized steel with Sherwin-Williams® low VOC primer and urethane paint from an almost unlimited palette. After the great paint finish Centerpoint then adds a final coat of special anti-graffiti finish that allows you to remove marker or spray paint if noticed within a few days. 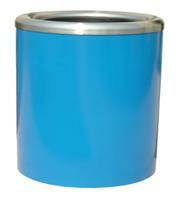 Centerpoint then provides a beautiful finish with an attractive stainless top that tips bags or packages into the bin. Security Trash Receptacles are recommended for transit terminals, schools, colleges and any retail, commercial, religious or government facility. Centerpoint utilizes heavy 304 stainless steel outer wall that is sanded and cleaned for a fabulous brushed finish. Centerpoint also includes a stainless top that completes the stainless Centerpoint then adds the ultimate in lasting performance with a CPM overcoat that seals the stainless from salt air or water and most chemicals. The Infinity can’t be beat for coastal or northern applications or anywhere stainless will enhance surroundings. The ultimate in design preference for any location. The background wall can be any color that Sherwin-Williams can provide. 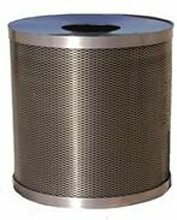 The outer wall may be almost any stainless perforated circular or square or special designer holes or expanded metals. Decorative metal finishes are perfect for the upscale designs of office buildings, resorts, hotels and malls or any event plaza that desires that special look with security that only Centerpoint can provide. Why trash cans? They are the easiest point of attack in our modern, package prolific society because anyone can throw anything into a trash can and walk away. Remember the Atlanta Olympic and Boston Marathon bombings using trash cans as the most reported? Common trash cans become part of the problem as they create secondary fragments that can travel several hundred feet before injuring or killing someone. Trash cans were the favorite target of the IRA in London and when trash cans were removed the ensuing death toll and damage from debris fires was worse. There is really no other practical way to collect trash in an efficient manner. Some manufacturers produced transparent receptacles with clear acrylic or polycarbonate panels and metal posts, bottoms and tops. During an explosive event the metal becomes secondary deadly fragments but that is not the worst part of these death cans. The clear plastic materials can’t be found with X-rays so a surgeon has the choice to either do nothing or start probing to find clear materials that they do not know where they are. Neither is a good choice. The concept of this product sprouted from some bureaucrats with the thought that keen eyed personnel would be able to determine a bomb from bag or cup thrown into the trash bin. Of course that would require one keen eyed guard to watch each trash can and never take a break or lunch or turn their head. That does not seem possible or financially prudent. If your transit system or facility has these products stay as far away as possible but better still request that all of them be removed ASAP. The only real solution is Centerpoint Security Trash Receptacles that will contain primary fragments, create no secondary fragments, mitigates horizontal pressures and fireball and save lives. Many of these, so called, Bomb Proof Trash Receptacles have been around and sold for a long time but the testing was sketchy, improperly performed and meant to conceal major weaknesses from lay purchasers of these products. Those cans had inflated force protection ratings and fail their own specifications in real explosive tests. Over $30 million and probably more now was spent on these poorly designed and built receptacles. In 2002 just after 911, Centerpoint Manufacturing, Inc. began development and patented the best and most competent Security Trash Receptacle in the world. Our unique combination of thorough testing, material science and manufacturing acumen has produced a Security Trash Receptacle that contains all fragments and mitigates and diverts multiples of force protection more than any other product. With 5 LEVELS of Protection and three capacity quantities plus a myriad of colors with many options we know you will be pleased with Centerpoint. When protecting your family, friends, associates and livelihood, why would you consider anything less than the one trash receptacle that provides real protection at a competitive price. Safeguard your facility’s easiest target with the Centerpoint product line. It’s not an expense, it’s an investment. Precision manufacturing and ethical business administration requires establishment and maintenance of a centerpoint. At Centerpoint Manufacturing, Inc., we believe in a philosophy of precision and quality in our products and integrity in all aspects of our relationships with customers, associates, suppliers and employees. © 2018 Centerpoint Mfg. All Rights Reserved. Designed by Dreamedia.